In this part you will discover how to integrate Social Login in order to easily let new users sign up for an account on your website by using their existing accounts from over thirty different social networks such as Facebook, Google, Twitter, Yahoo, Instagram and LinkedIn amongst others. Accomplished the Social Login Setup. You have added a table to your database in order to store the user_token. You have added a simple callback script to your system. The library must be included only once on each page. If you have already implemented another of our services, then you might already have added the corresponding code. In this case please skip this point. It is compatible with pages served using both HTTP or HTTPS. The // before the path to the library is a protocol-independent absolute path, which detects whether your site uses HTTP or HTTPS. No modification of the code on secure pages is required. Our recommendation is to add this code snippet to your website template so that it appears before the closing </head> tag. As it is loaded asynchronously, you can however add it basically anywhere in your template. 5. Add Social Login to your registration page. Update the template of your registration page and add the following code at the place where you would like the Social Login icons to be displayed. Make sure to replace #callback_uri# by the full URL pointing to the script created during the setup. The UI goal should be that users can easily	identify that they can signup with their social network account, but that users without a social network account can continue to register normally without being confused. If you have finished setting up your registration page, do a first test by clicking on one of the social network providers. You should be prompted to login with your social network account, then be redirected to the callback_uri and see a message like Connection token received: 7a559a39-51a5-4f21-92aa-cc880da2233f. 6. Setup the callback script. After having clicked on a social network icon the user is forwarded to the login page of that social network. Upon successful authentication the user is redirected back to the callback_uri. The purpose of the callback script is to read the POST (or GET if you use Direct Connect) value	connection_token and to fetch the user's social network profile data by sending a HTTP request with that token to the OneAll API. 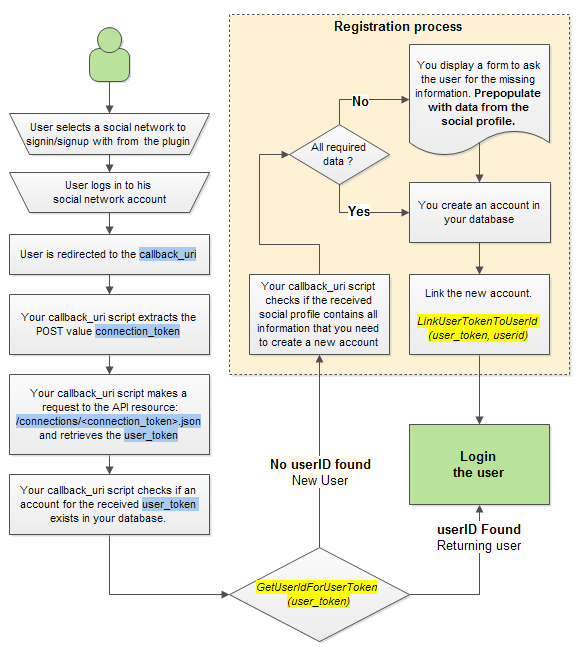 In the first part of the guide you have added a basic callback script to test the Social Login integration. Now you need to improve and replace that script with a working version. Here an example. // that has connected with the social network account. // Optionally display a form to collect  more data about the user. // 1a2) Attach the user_token to the user_id of the created account. You should now be able to create a new account on your website by using a social network account. The callback script should detect that you are either a new user or a returning user and log you in.